Massanutten Village is the original and largest component of the Massanutten community. Understanding its history is important to understanding the arguments for and against any possible town incorporation. Development on Massanutten Village began in 1971 by the Massanutten Development Company which was made up of four local businessmen (lead by John L. Hopkins) and the Del Webb Corporation. It was designed primarily to be a private-gated residential community. It was zoned by Rockingham County as a Residential Planned Community (R-4) District located north of Route 33, west of Route 602, and east of Indian Trail Road. County Zoning District R-4 requires a master plan approved by the County Supervisors and the first Massanutten Village Master Plan (dated August 1971) delineated a project area of roughly 3,000 acres with approximately 5,000 dwelling units for an estimated 15,000 residents. The second Master Plan (dated July 1972 and shown on the right) increased the project area to more than 5,000 acres with more than 8,000 dwelling units for more than 25,000 residents. There were a total of ten (10) Master Plans made in the first 10 years of the project with, except for the first, only minor adjustments made in the boundary lines and dwelling types keeping the overall project size roughly the same. It is interesting to note that the original project size suggested from the outset that Massanutten would eventually meet all the requirements for an incorporated town in Virginia. The project design included a variety of housing accommodations (single family homes, townhouses, and condominiums) located in separate areas (R-4A, R-4B, and R-4C respectively) along with a Village Center that included commercial and recreational properties. It is worth noting that these four areas are all translatable to self contained zoning districts. The project was basically split into two areas by the Massanutten Mountains, the major part of which runs roughly north and south. The project had two entrances — one accessed from Route 644 (Resort Drive) on the east side and one accessed from Happy Valley Road on the west side — with each entrance having its own security gate house. Development basically began from east to west with the Massanutten Development Company constructing the infrastructure (roads, utilities, etc.) and resort-type amenities (skiing, golfing, etc.) while selling lots to individuals who would acquire contractors to construct their homes. By the end of 1973, eight (8) single family home subdivisions were recorded with separate Plats and Covenants along with three (3) multi-family home subdivisions. The single family home subdivisions were called Braxton Glen (Unit 1), Wythe Forest (Unit 2), Harrison Heights (Unit 3), Lee Woods (Unit 4), Nelson Woods (Unit 5a), Piney Mountain, Village Woods, and Belleview Glades. Belleview Glades was the only recorded subdivision that was located on the western side of the Massanutten Mountains. The three (3) multi-family home subdivisions were called Grenoble Woods, Skiside Courts and Skiside Courts East which were all located adjacent to the ski slopes. By the end of 1973, fourteen (14) single family homes had been constructed and twenty-four (24) more were under construction. The Massanutten Ski Slopes were fully operational. And, public utilities to include water and sewerage were available to many of the subdivisions. 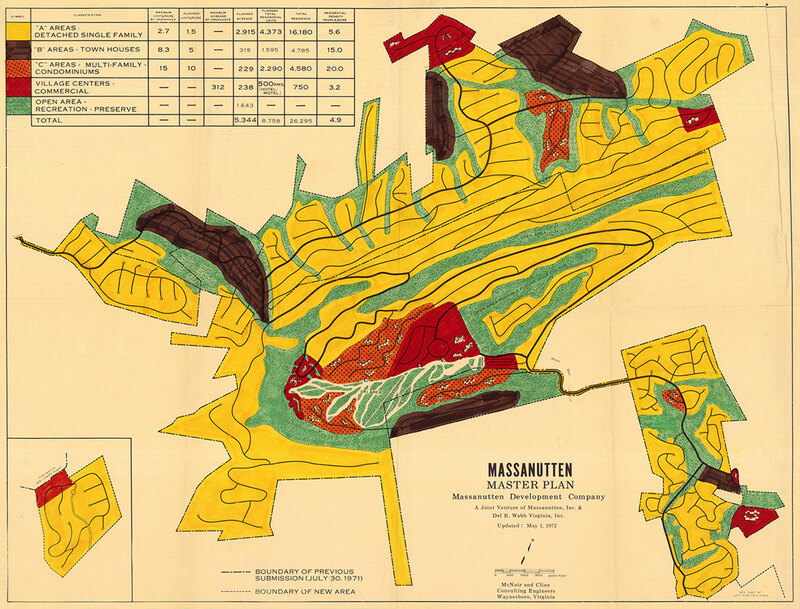 The Massanutten Property Owners Association (MPOA) was incorporated in January 1974, pursuant to state law. MPOA was created to govern the community and to provide administration, security, maintenance, and amenity services. Its first officers were made up of representatives from Massanutten Development Company and from ordinary property owners. Most roads and open spaces were deeded to MPOA by Massanutten Development Company for use by residents and maintenance by the Association. MPOA’s first operating budget was roughly $150,000 in 1974. The years of 1975 and 1976 saw significant changes to Massanutten Village to include the buyout of the local businessmen by the Del Webb Corporation. Three (3) more single family home subdivisions were added called Greenview Hills, Keeler Woods (Unit 6), and Unit 9 (which had no other name). And, one additional multi-family home subdivision was added called Quails Nest. A golf course was constructed in the Kettle. A Massanutten Hotel and Conference Center was planned. Plus, two more areas with different types of housing accommodations were added to the Master Plan — an area for Multi-Family/Commercial Housing and an area for Single Family/Multi-Family/Commercial Housing as shown below in the table from the September 1976 Master Plan. These areas were planned to provide overnight and weekly accommodations (hotel rooms, townhouses, condominiums, and single family homes) for tourists from the general public. This stark change in direction for the project, approved by the Rockingham County Board of Supervisors, moved Massanutten Village from a private-gated residential community to one more open to the general public. By the end of 1977, the Massanutten Development Company had completed nearly all of the infrastructure and amenity construction in the eastern portion of the project and sold virtually all the lots in seven of the first eight single family home subdivisions and roughly half of the lots in the three single family home subdivisions added in 1975. The Massanutten Development Company abandoned further development of the project and sold it to Massanutten Village, Inc which was made up of local businessmen to include attorneys Henry Clarke and Stephen Bradshaw. Before the sale, Massanutten Development Company deeded nearly all of the roads and open spaces as well as the security, maintenance, and amenity assets to MPOA. The business model of Massanutten Village, Inc. was essentially to develop the two newly designated project areas for overnight and weekly accommodations of tourists — although, they did record one additional small single family home subdivision called Unit 10. The business model used a new concept in property ownership called timesharing, whereby one week of each year of a single housing unit was sold to an owner. This concept was coupled with completing the construction of the Massanutten Hotel and Conference Center. If successful, the business model would accelerate the overall number of people coming to Massanutten Village and increase property values. The consequence was making it less and less a private-gated residential type community and more like an open resort community. However, the early 1980’s saw very tough economic times and Massanutten Village, Inc. went bankrupt. In 1984-85, Great Eastern Resorts purchased from the Bankruptcy Court the undeveloped parts of Massanutten Village. Massanutten Public Service Corporation purchased from the Bankruptcy Court the public utilities of water and sewerage. It should be noted that MPOA continued operations separate from the bankruptcy. Over the next twelve years, Great Eastern Resorts focused on completing the development of the two designated project areas for overnight and weekly accommodations of tourists using the Massanutten Village, Inc. business model. The two project areas were eventually integrated into one area on the Master Plan and designated by the County as Area «D» Timeshare Units. 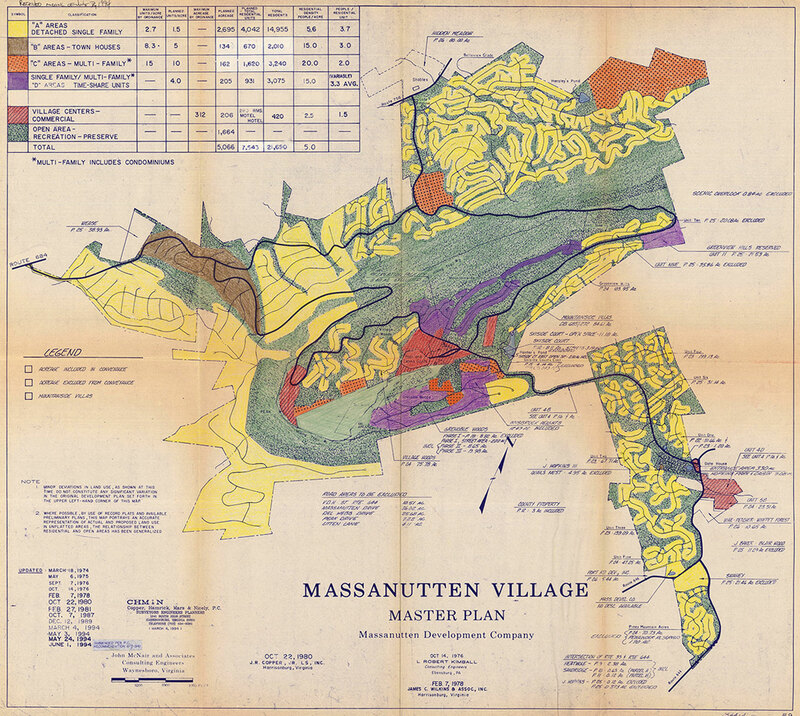 The Massanutten Village Master Plan of June 1994 (shown on the right) delineates a total project area of more than 5,000 acres with more than 7,500 housing units (including more than 900 timeshare units) for more than 20,000 residents. By the end of 1996, nearly 1.2 million vehicles were entering into the gate of Massanutten Village yearly and of that amount more than 350,000 vehicles (roughly 30%) were from the general public — not related to MPOA. Again, this emphasizes the number of people coming into Massanutten Village from the general public and that Massanutten Village was becoming even less like the original private-gated residential community. The table below summarizes the differences in the Massanutten Village Master Plans of 1971, 1972, 1994, and the latest Master Plan of 2002. The project area, housing units, and planned population numbers are compared. It should be noted that there has not been much change in the planned Massanutten Village since 1994. The four Master Plans are also compared to the actual developed numbers as recorded with Rockingham County. Only thirty percent (30%) of the project area and total number of housing units have developed in Massanutten Village’s forty (40) year history to date. Thus, it is very important to point out that roughly 70% of the Massanutten Village project is yet to be developed. The plan for this area is less refined. And, much has been learned over the last forty (40) years relative to infrastructure and services which could be included in the details when plans for the undeveloped area are actually realized and construction is undertaken. The actual population of Massanutten Village (as opposed to the U.S. Census population for the Massanutten area as a whole) has been estimated to be roughly two thousand (2,000) year round inhabitants. This is a far cry from the planned population of over twenty-three thousand. This is because the actual number of year round inhabitants in Massanutten Village is significantly increased by people who regularly stay in its timeshare units and hotel rooms. It has been estimated that there could be a total of more than 6,000 persons staying overnight in Massanutten Village on most weekends. This is born out by the fact that more than 2.44 million vehicles entered into Massanutten Village in the year of 2010 — to include an average of more than 7,500 vehicles per day in December 2010 alone. Of the 2.44 million vehicles, more than 1.3 million vehicles (more than 54%) were not related to MPOA — they came from the general public. MPOA has provided primary law enforcement services and exclusive road maintenance services to Massanutten Village since 1974. Currently, the MPOA police department is larger than any town in Rockingham County. The MPOA maintenance department services fifty-two lane miles of road which is also more than any town in Rockingham County. And, MPOA has its own administration staff that manages an annual budget in excess of $2.5 million overseen by a thirteen (13) member Board of Directors.